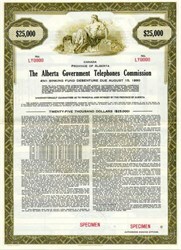 Beautifully engraved SPECIMEN certificate from the Alberta Government Telephones Commission no later than 1967. This historic document was printed by the Canadian Banknote Company and has an ornate border around it with a vignette of an allegorical man holding a globe and looking out into the distance. This item is over 51 years old. Alberta Government Telephones adopted the name Telus in October 1990, after the province decided to sell shares in the Crown corporation to the public. The initial public offering featured 75 million shares at $12. A year later the government sold its remaining 54 million shares at $15. When Alberta became a province, it was one of the new government's first major political decisions to get into the phone business. Premier Alex Rutherford's first provincial budget in 1906 included $25,000 for phone development to combat Bell Canada's monopoly. AGT commenced operations later that year, marking the first time a government got directly involved in the phone business in North America. The province took its first step to distance itself from the business in 1958 when it established the Alberta Government Telephones Commission which managed the system and became responsible for long-term financing.